In college, I had a short story published in a national magazine. I was the only student in our English Department to get published at that level. I think that’s when I realized I was pretty good at writing. Instrumental music helps with the writing process. I can listen to the same piece for days if it helps me write some pages. Also, people watching helps me to formulate some ideas for characters when I’m working on a book. Death at the Presidents Church just came out earlier this year. I wanted to start a new mystery series since I’ve been working on another cozy mystery series for the last few years. This book follows two sisters in Washington D.C. They are long time socialites who have lived in the city for more than seventy years. They are well connected and have met congressmen, senators and even presidents over the years. So I thought it would be interesting to take these two ladies and give them a reason to get caught up in the death of a homeless person near their church. It is through their social connections that their investigation leads them to some surprising discoveries about the victim and his connection to one of Washington’s most influential families. What I like about Charlotte Dupree is that she is based on a good friend of mine who passed away many years ago. She was also named Charlotte and even though she looked like a sweet grandmother, she had worked in the House of Representatives. She was tough as nails and wouldn’t mince words on her political views. I thought it was an interesting combination of looking grandmotherly but being tenacious and being a Washington insider. The Dupree sisters would be the first to say they aren’t the smartest, but they know how to find information and they never give up when they want to find the truth. What is your characters most serious flaw? Charlotte and Ruth have a soft spot in their hearts for Mezzo, a cat that they’ve spoiled rotten. I’m afraid they would let that cat do almost anything. Is this a series and if you have another series how is this one different? This is the first book in the Dupree Sisters Mystery Series. I’m writing the second book at the moment and I’m afraid to say that poor Mezzo will get some competition from another cat that the sisters will take in. While this series takes place in the nation’s capital, my other series I’ve been working on takes place at a retirement home in rural Pennsylvania. The series is called the Bess Bullock Retirement Home Series and it has sold very well. There are five books in the series. I would best describe Bess Bullock as a sweeter version of Miss Marple in how they both use their powers of observation on the people around them. My youngest son has some interesting thoughts that make me smile. He’s in third grade so he has an interesting way of looking at life…that sometimes makes me laugh. If you’ve ever hung around nine-year-olds, you know how they are. Losing my mom a couple years ago was probably the hardest thing. She was a painter, so I credit her for my “creativity” genes. I’ve been lucky to never have writer’s block. I really subscribe to the idea of writing down the bones of the story. That first drafts won’t be perfect. Just get it down, warts and all. I know some writers want everything to be perfect the first time they write a story, but perfection can lead to writer’s block, in my opinion. Writing is subjective. What will work for you might not work for someone else. For example, some writers like to outline every detail of a story and stick to it. Other writers will let the story take on a life of its own and lead them to an ending they didn’t plan. Everyone is different as a writer, so just use an approach that works for you. Book 2 in the Dupree Sisters, which I’m hoping will be done late this year. Also, outlining another Bess Bullock story. I was reading a review about one of my Bess Bullock novels. 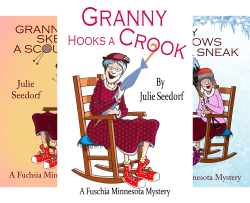 One reviewer was looking for more humor in this particular book and then went on to cite your Fuchsia Minnesota Mystery Series as a better choice. That made me laugh. Small world. James Joyce is my favorite writer. The way he uses language inspires me. A quote he gave that I think is a good road map for developing characters is: “Mistakes are the portal of discovery.” That really is true for my fictional characters. They have met many presidents. They are politically well connected. They were born and raised in the social circles of Washington D.C. So why have Charlotte and Ruth Dupree taken such an interest in the death of a homeless man? Drawing from their experiences with former presidents, along with their usual charm, the Dupree Sisters find themselves navigating through a labyrinth of Washington luncheons, social events, and gossip to uncover the facts behind a death that most people would overlook. Join the Dupree Sisters as they use their persistence and good manners to learn the truth behind The Death at Presidents Church. Make sure take the time to comment to win a Kindle copy of Death At The Presidents Church. And while you are at it follow this blog and sign up for my newsletter. Have a beautiful day.